I finished reading that art of tidying book. It was a library book so if I’m going to follow her plan I’ll have to do it from memory or find the resources elsewhere. I suppose it doesn’t really matter, because I only plan to follow it loosely anyway. Following it loosely means I’ll declutter when I get the inkling and have the energy. What that means is that when I come across something I forgot I had that does not – to use her terminology – “spark joy” I will quickly discard of it and happily move on with my life. For example, tonight I said goodbye to that clown blanket I mentioned on Tuesday, along with a quilt I was given after volunteering at a children’s grief camp (the dog ripped it months ago, and I don’t fix things sooo, you know). I’ve included a picture of the clown blanket below. (One of my best friends has a serious clown phobia, so… my sincere apologies Tracy!). 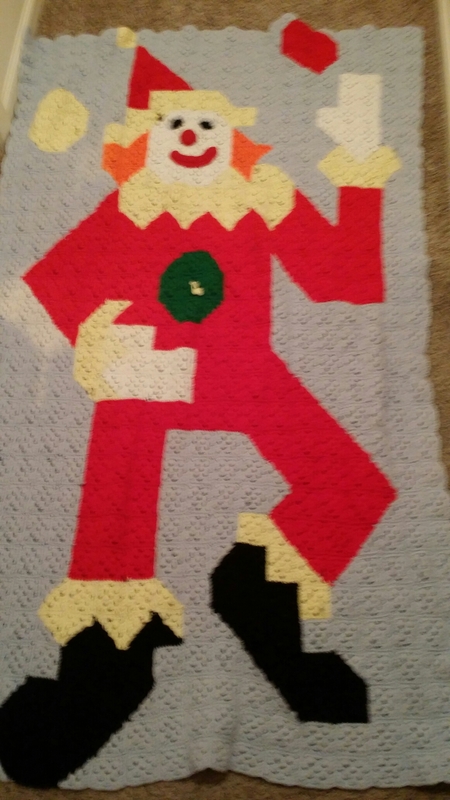 My grandma was in a clown ministry so I think that’s why she made these blankets. It kind of looks like he’s waving goodbye, doesn’t it? You bet I waved right back, with the same silly smile even.